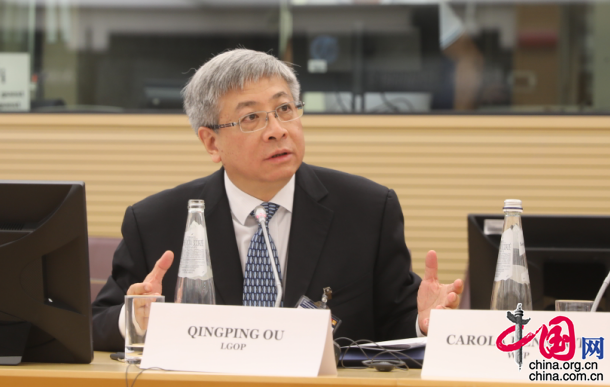 Ou Qingping, Vice Minister of China's State Council Leading Group Office of Poverty Alleviation and Development (LGOP), addresses a speech at the International Workshop on Global Poverty Reduction Partnerships in Rome, Italy, on June 5. An updated exchange and cooperative relationship with win-win cooperation as the core is important to reduce poverty in the world. Ou Qingping, Vice Minister of China's State Council Leading Group Office of Poverty Alleviation and Development (LGOP), said at a workshop. The International Workshop on Global Poverty Reduction Partnerships was held in Rome, Italy, on June 5, which aims to discuss best knowledge-sharing practices among countries and development partners. It also sought efficient mechanisms in support of the UN Sustainable Development Goals (SDGs), in particular SDG1, No Poverty and SDG2, Zero Hunger. Representatives from the Rome-based UN Organizations, government officials, academics and media attended the forum. According to Ou, China clarifies the target and task that all the rural impoverished people under current poverty reduction standard shall be lifted out of poverty, all impoverished counties must shake off the poverty label, and overall poverty in impoverished regions will be tackled by 2020. He emphasized that China aims to win the uphill battle against poverty by leveraging the institutional advantages, issuing fundamental guidelines, increasing investment, reaching a consensus for poverty reduction in the whole society, raising impoverished people’s consciousness to act proactively and strengthening supervision and examination. In terms of international cooperation, Ou said that China has been active in poverty reduction in cooperation with Africa, Latin America, ASEAN member states, and the UN. He claimed that the Seminar on Global Poverty Reduction Partnership in 2017 has received positive responses. The workshop that is successfully convened again in Rome this year indicates that a new cooperative relationship for poverty reduction is coming into shape. “China is willing to make full use of this dialogue and exchange mechanism to share China’s experiences and bring forward China’s proposals,” Ou said.